After the great success of the 3850 Custom Series Bb cornet, the professional cornet line up was expanded to include an outstanding orchestral C cornet. 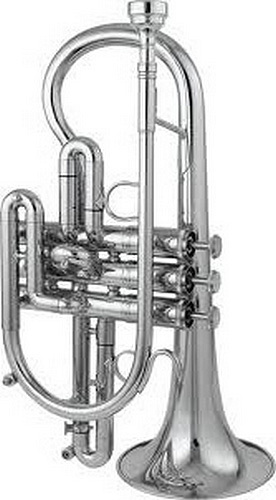 The 3810 Custom Series C cornet is an upgraded and improved version of the original 810 Eterna cornet. The upgrades include nickel silver balusters, an all new mouthpipe design, and a one piece, hand hammered, yellow brass bell. The new and improved 3810CS is perfect for orchestral situations that call for a C cornet thanks to its unsurpassed intonation, ease of play, and excellent tonal production. Silver plate finish, 4.3/4 one piece hand hammered yellow brass bell, mouthpipe in gold brass, bore .460, hand lapped nickel silver pistons, 1st slide saddle, third slide ring, supplied in woodshell case.